When survival is the name of the game, the Gavilan® 12" Survival Machete will keep you going the distance. 5ive Star Gear forges the blade from British steel and leaves their Gavilan® de Incolma a Colombia logo along the blade as a marker of premium craftsmanship. The handle features rivets and a non-slip grip material, ensuring users maintain a firm hold with impressive control and fine handling. 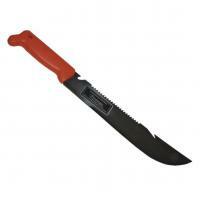 The machete includes a lifetime manufacturer's guarantee and comes packaged in new, consumer/retail-friendly packaging. 5ive Star's machetes are made in Columbia.